Piloting – is the first of a two-part navigation series for inland and coastal boaters. 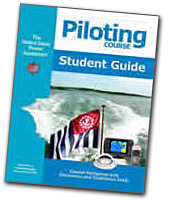 Piloting teaches the essentials of safe navigation using GPS and electronic tools in conjunction with charts and available marine data (waypoint navigation). In order to check the GPS, and to navigate in the event of any uncertainty, traditional navigation skills are taught. You learn how to use landmarks and navigation aids to check your position and navigate using dead reckoning.